I am going to give you simple tips on how to frost a cake beautifully and easily every time. A thick creamy mixture which is spread on the sides and tops of cakes. Frosting can be decorated in many ways. When a filling is not used, the frosting is usually spread between the layers in place of the filling. Used to fill between layers of cakes. It is a thick mixture which sometimes contain fruit and nuts. A thin mixture of sugar and liquid. 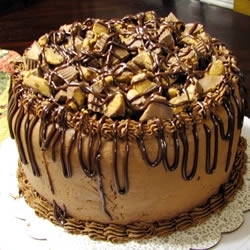 It is poured on the cake and will give the cake a glossy appearance when it hardens. Similar to a glaze but not as thin, an icing is a mixture of liquid and powdered sugar. It is used as a topping for rolls, coffee cakes, cakes and pastries. There are five different frosting's that are used for sweets, desserts and cakes. They are: cooked, sweet, rich butter, confectioners' sugar and fudge. A cooked frosting is made with egg whites and has a very good flavor. A sweet topping is simple to make and can be baked or broiled on the cake. A rich butter frosting is a little more complicated to make than a sweet topping, yet it is excellent because it will keep for several days. Confectioners' sugar frosting is make from powdered sugar, liquid and flavoring. It is a simple frosting which requires very little time to prepare. Fudge frosting is made in a similar way to candy and will turn easily into sugar if not carefully watched. You can do several things to change a frosting and make it different. Once very popular change is to tint the frosting. Be sure not to tint more of the frosting that you need and be careful to use one drop of food coloring at a time if you want a more delicate color. Too bright a color on a cake is unappetizing. If the frosting is too thick, add a drop at a time of the liquid used in the recipe until it is of the desired consistency. If the frosting is too thin, add powdered sugar a little at a time until it is thick enough. The next section is how to frost a cake. Learning how to frost a cake is easy and requires little skill. The items I list are needed to make this a "quick and easy" task. First, be sure you have a flexible spatula (8 inches long), scissors, a cake decorator set, waxed or parchment paper, toothpicks and a sharp knife. 1. Make certain the cake and frosting are cool. When the frosting is not thoroughly cooled, the cake will become soggy. Frosting is also easier to apply to the cake in a cool room. 2. To prepare the cake for frosting, trim the ragged edges of the cake with the scissors. Any loose crumbs should be trimmed also. Place strips of waxed (or parchment) paper under the edges of the cake to catch any drips. When you have finished frosting the cake, remove these strips. 3. Single layer cakes are frosted by placing the layer, right side up, on the cake plate and applying frosting to the sides and top of the cake. Frosting is more easily applied to the top of the cake than to the bottom. 4. Cakes with two or three layers is frosted in the same manner as a single layer. Place the first layer upside down on the cake plate. Spread the layer with filling or frosting and let set. If you have a two-layer cake, place the second layer right side up on top of the frosting or filling. Spread the frosting on the side and the top of the layers. If you are frosting a three-layer cake, place the third layer on top of the frosted or filled second layer with the right side up. Then apply frosting to the sides and top of the cake. 5. Want to learn how to frost a cake when baked in a tube pan? First place the cake upside down on a cake plate. If you plan to cut the cake into layers, mark around the sides of the cake with toothpicks so you will get an even layer when cut. Be sure to use a sharp knife to cut the cake. Spread the frosting or filling between layers and then frost the sides and top of the cake.